Listen up, wildlife enthusiasts! Here is a tiger safari, 18 hours from Chennai that should be on your bucket list, if you haven’t already explored the Tadoba Tiger Reserve. Starting at INR 4,500, here’s how we spent a weekend in the wild and stayed at the Taboda Tiger Valley Resort. This weekend we left technology behind and set out into the wild. A safari in the Tadoba Jungle at Chandrapur, Maharashtra located around 18 hours from Chennai is all about spotting tigers, bears, sometimes leopards and many exotic birds. The first step is to check in to The Tadoba Tiger Valley Resort just like we did. Around one hour from the Chandrapur Railway Station, we reach the resort and after that everything is taken care of by the resort staff. Packages start at INR 5,000 which includes rooms, safari rides, meals and more. The resort provides pick up and drop to the railway station and provides packed meals as well. Remember, carrying an Aadhar Card is compulsory for both the resort and the safari. On day one we were lucky enough to spot a leopard, considered a rare sight at Tadoba and many exotic birds like the Honey Buzzard, Brahmin Mynah, Paradise Flycatcher, Pond Heron, Kingfishers, Woodpeckers, and Racquet Tailed Drongo to name a few. And of course, there were the pretty Peacocks, wild boars, mighty Bisons, ever curious Deers and goofy Langoors. Right outside the Agarzari Zone is the merchandise store, in case you want to pick up wildlife books and take back home some Tiger printed tees and more. Day two we were high on adrenaline as we spotted the majestic tigers finally and followed their trails as well, almost till one of the tigers pounced its prey. What a sight! And oh! Tigers here have names and the guides identify them with their stripes and skin spots which we thought was really cool. Sonam, Madhu, Madhuri and Maya are few of the famous and commonly spotted tigers and we were thrilled to spot Maya with her adorable cubs and the three and a half year old Madhu whose royal stride stole the show. Yes, we got them National Geographic feels! Don’t be afraid, it’s as safe as can be here from our experience. The drivers and guides are trustworthy and drop you back right at the doorstep of your resorts. Also, the safari jeeps are comfortable and spacious to take out your gaint 100-400mm lenses, great for wildlife photography shots. While November to February is recommended as a good time to visit, the last week of June too is a pleasant time to visit. So we suggest you hurry to this amazing National Park, before the monsoons set out in full force! They have around 10 suites and dorm rooms as well. The resort is located right in between the vast lands and is quite a secluded place, just minutes away from the tiger reserve. We didn’t give in to resting any time as we wanted to head out for adventure ASAP, so hello safari!. 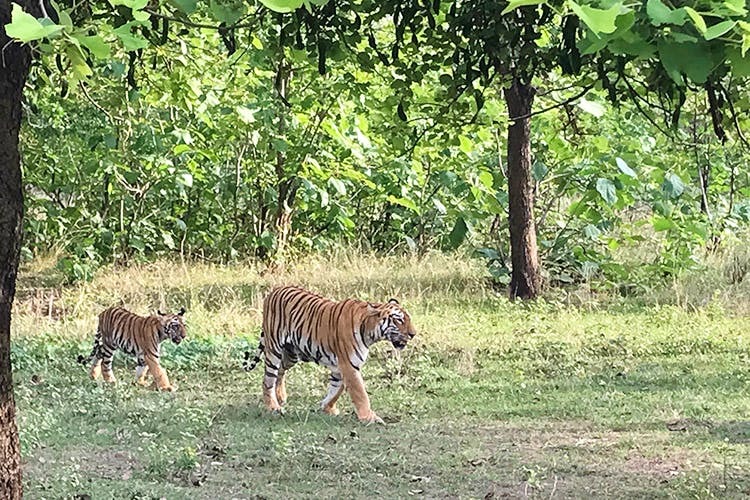 The Tadoba Tiger Reserve boasts of 88 tiger residents and we set out to spot these beauties. Ideally recommended for two days, you could go for around four safari rides and try your luck at spotting the Tigers and other wild animals. An ideal safari ride costs around INR 4,500 for 5 people. Usually, the early morning 5am safari rides are most recommended. Apart from which post 5PM is a good time spot the beasts out in the wild. Patience is key at Tadoba. Visitors wait for almost one hour at the same spot to spot the tigers and it is highly recommended to stay put at one place. Plus, don’t forget to book early as all the resorts and safari slots fill up pretty fast.